I have so many pretty Lynnderellas to show you right now, I had better hurry up and get to swatching them all! Today I have two gorgeous LE Lynnderellas for your viewing pleasure. 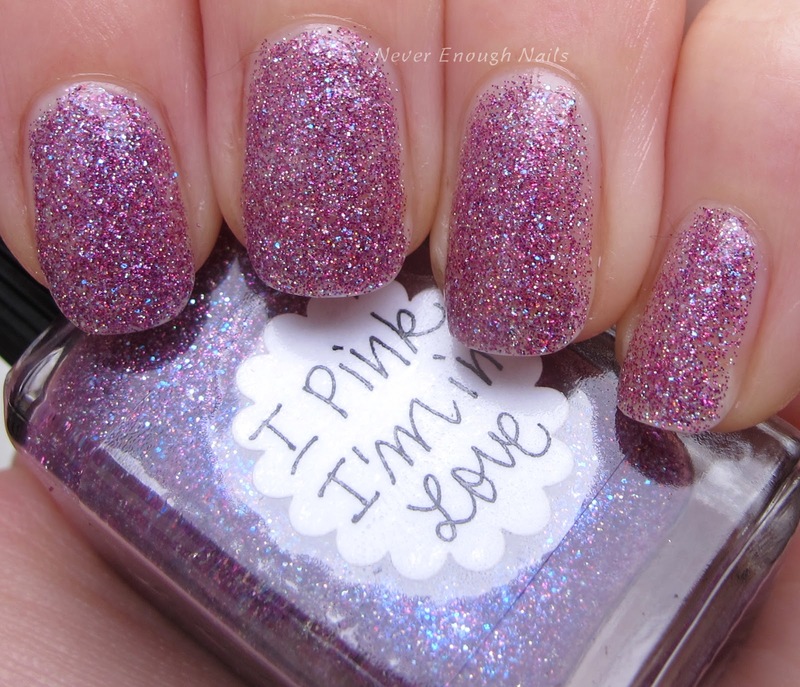 Lynnderella I Pink I'm in Love is a stunning mix of pink, silver and bluish lilac holographic microglitters. The silver and lilac really add a lot to this polish, making it much more special than a plain pink microglitter. I hope you can see them twinkling prettily here in these pictures! It's been raining and cloudy a lot lately and I always feel holo glitters pop more in the sun. This is three thin coats of I Pink I'm in Love. It could easily have been two regular coats, but you know I'm a habitual three-coater. It was lovely to apply and wore like iron for the several days I had it on. 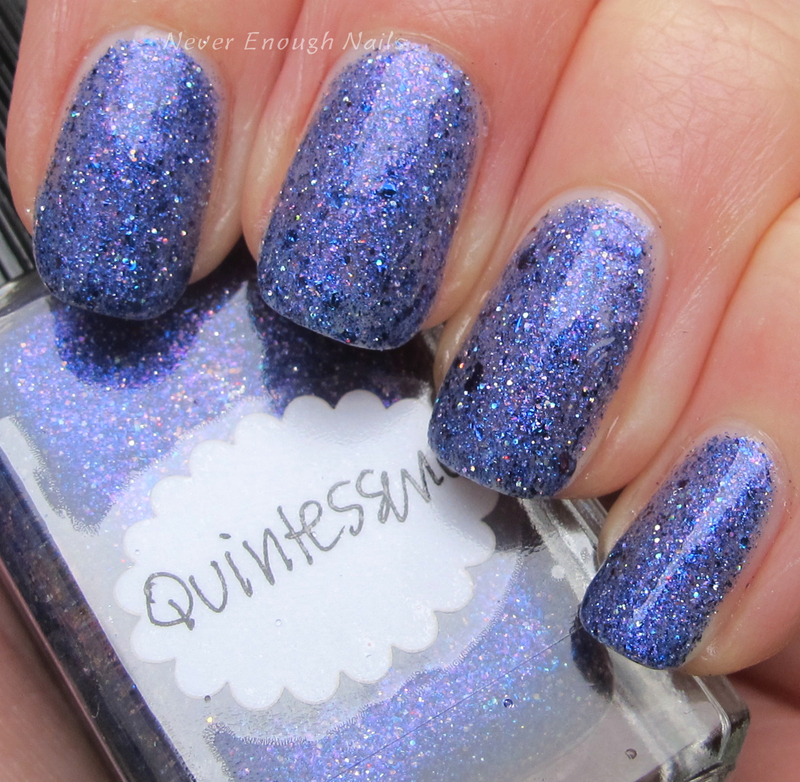 Lynnderella Quintessence is a really unique polish. 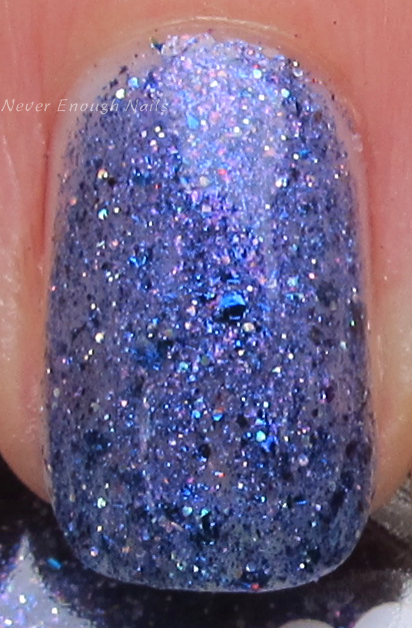 It has color-shifting flakies, blue flakies that are really iridescent and rainbow-y and blue-violet glitter in a shimmery blue-violet base. Lynnderella's description says the base is translucent, but it builds up nicely so you can wear this all on it's own, like I did here. This is three thin coats of Quintessence. This was pretty easy to apply. Sometimes a flakie would hang off the edge of my nail, but I just pushed them back on to the nail and they were fine. Check the Lynnderella eBay store or Lynnderella StorEnvy for these two LE beauties and more. For more information about Lynnderella, please check out lynnderella-lynnderella.blogspot.com. Also, like Love Lynnderella on Facebook for more pretty swatches!